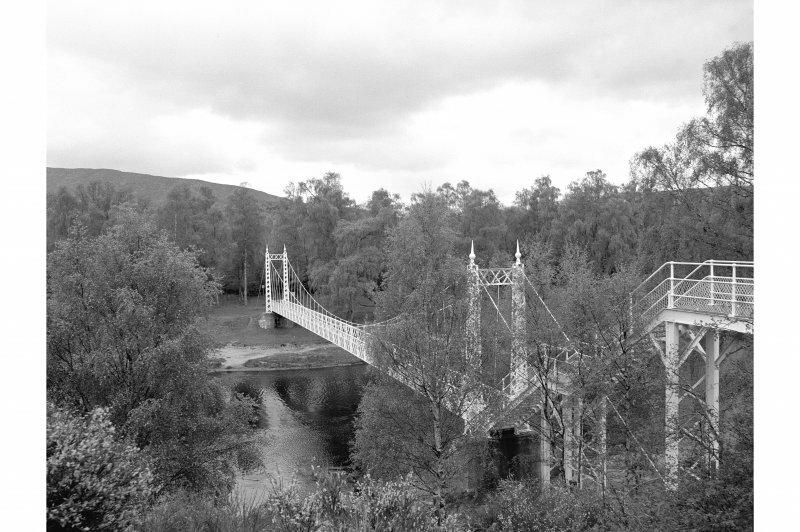 Cambus O' May, Suspension Bridge View from downstream, E bank, raised walkway to bridge in right foreground. 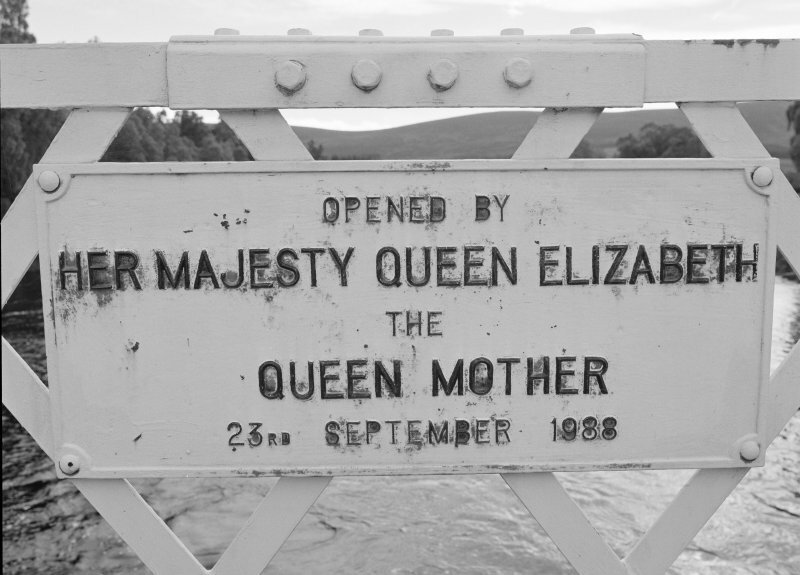 Detail of plaque commemorating the re-opening of the bridge by Queen Elizabeth the Queen Mother in 1988. 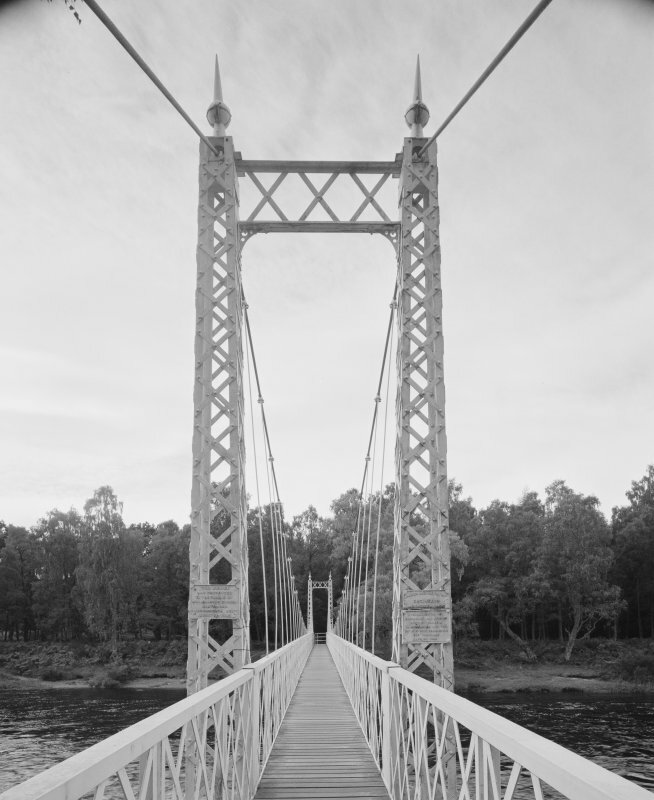 View from SW in the centre of the bridge, looking along its wooden deck, showing suspension rods and cables, and the NE tower. 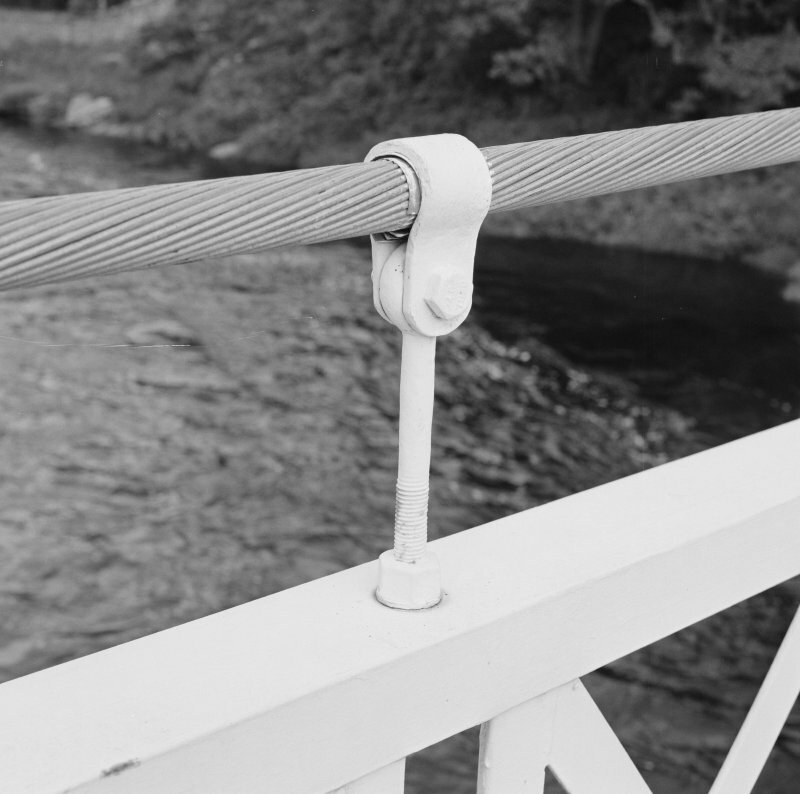 Detail view of short suspender rod with cable clamp. At the time of survey, there were plans to replace the clamps on the bridge. View of portion of lattice steel parapet, and of plaque commemorating the re-opening of the bridge by Queen Elizabeth the Queen Mother in 1988. 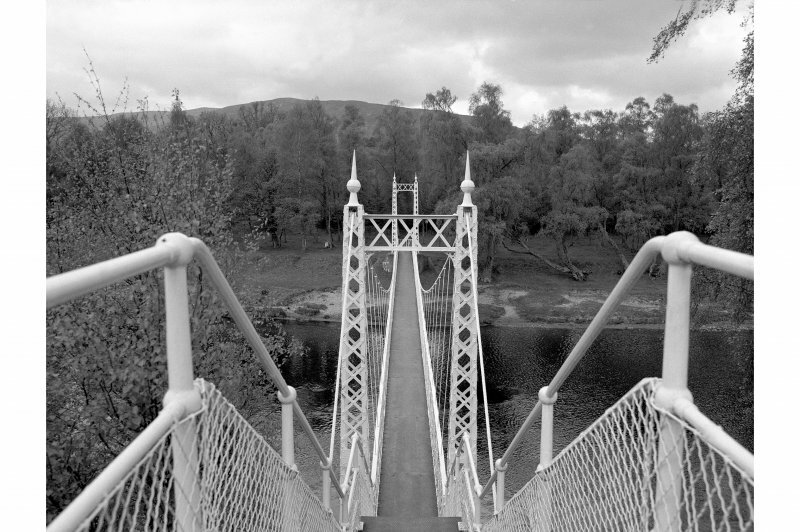 For comparable suspension bridge (also presented by Mr Gordon) at Polhollick (NO 3438 9651), see NO39NW 5. (Location cited as NO 421 977). 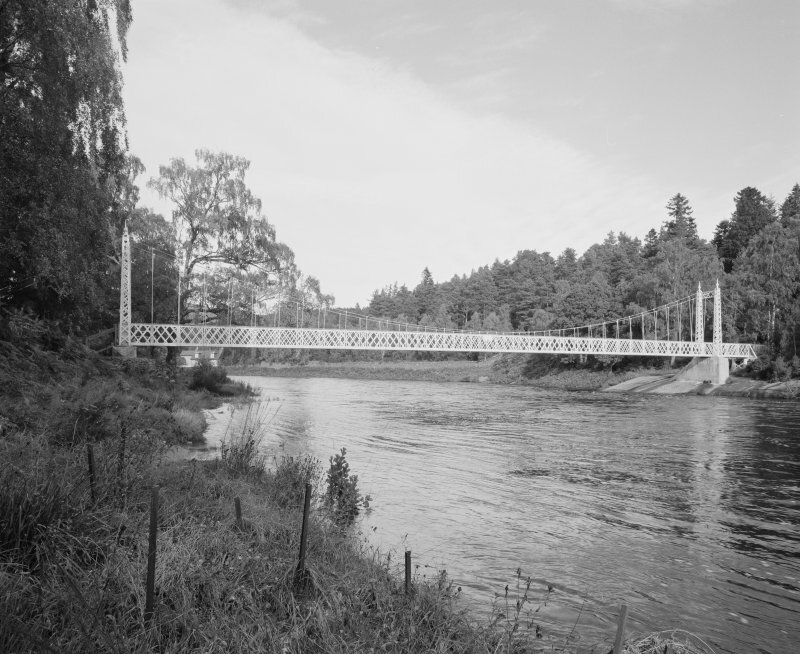 Suspension footbridge, Cambus o' May: built 1905 by engineers James Abernethy and Co., Aberdeen; presented by Mr Alexander Gordon, Southwood, Hildenborough, Kent. 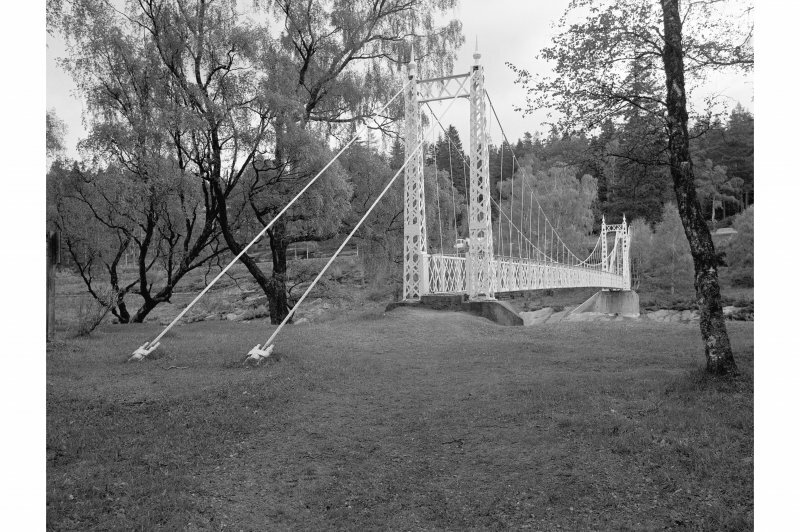 A light lattice-truss span supported by steel-wire-rope main cables and suspenders with lattice-girder pylons with ball finials. 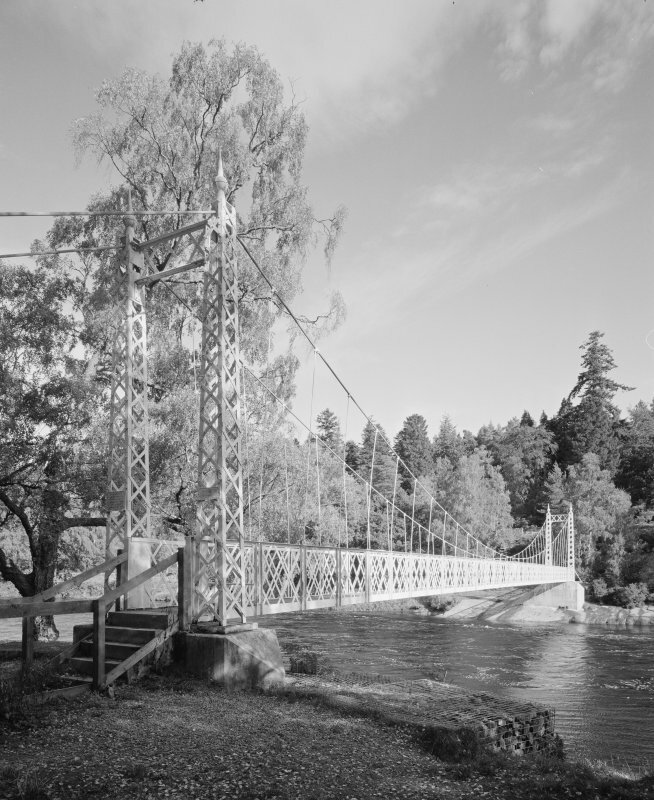 (Suspension bridge of wire rope and truss deck type: location cited as NO 421 977). Built 1905 by James Abernethy and Co, engineers. Lattice-girder pylons, wire-rope cables, rod suspenders, lattice truss span. 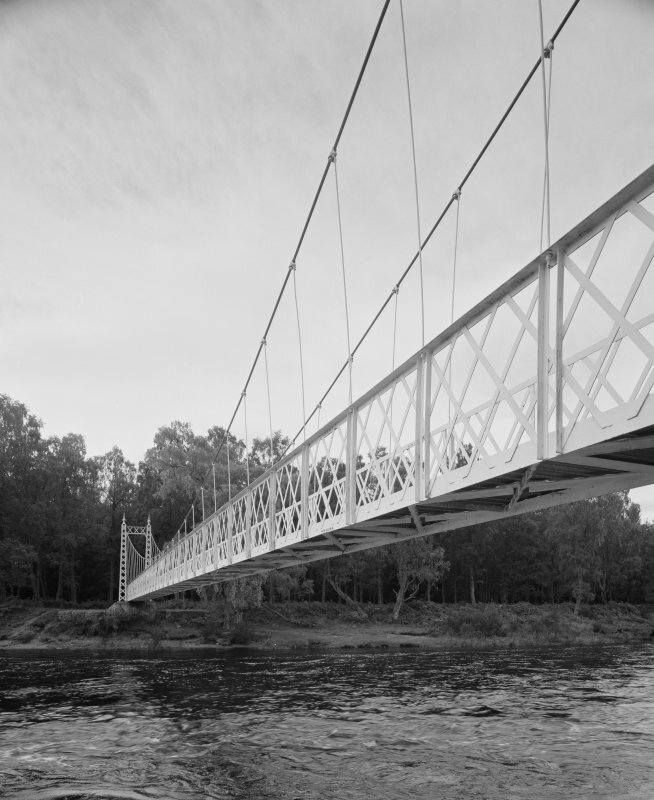 Public footbridge, presented by Alexander Gordon, Southwood, Hildenborough, Kent. (Location cited as NO 421 976). 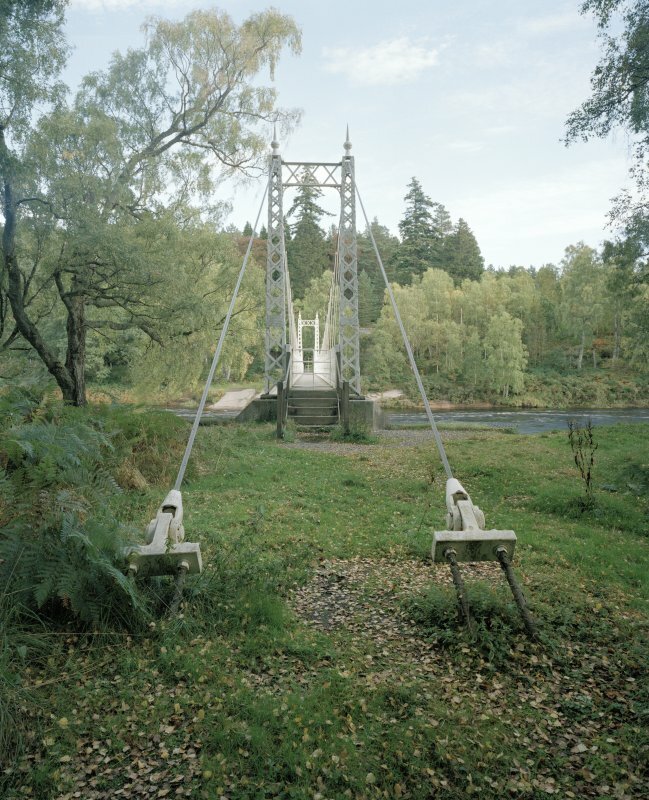 Cambus o'May, beside the A93 is a white painted suspension footbridge; it was refurbished in 1988 by Kincardine and Deeside District Council, having fallen into a partly ruinous state. 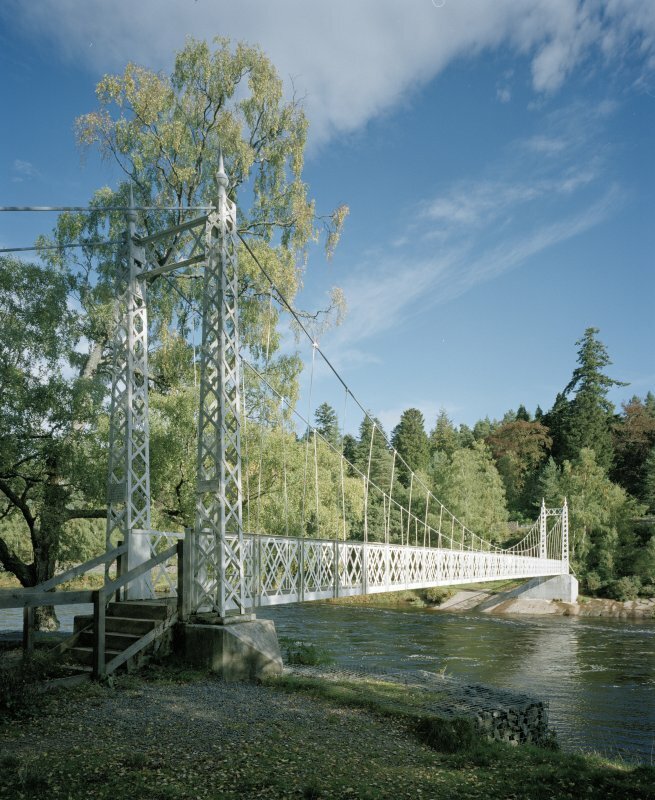 Built in 1905, it was a gift to the area by Mr Alexander Gordon, from Kent; it was designed by James Abernethy, of Aberdeen. Steel rope cables curve down from the tapered lattice pylons which have ball finials. 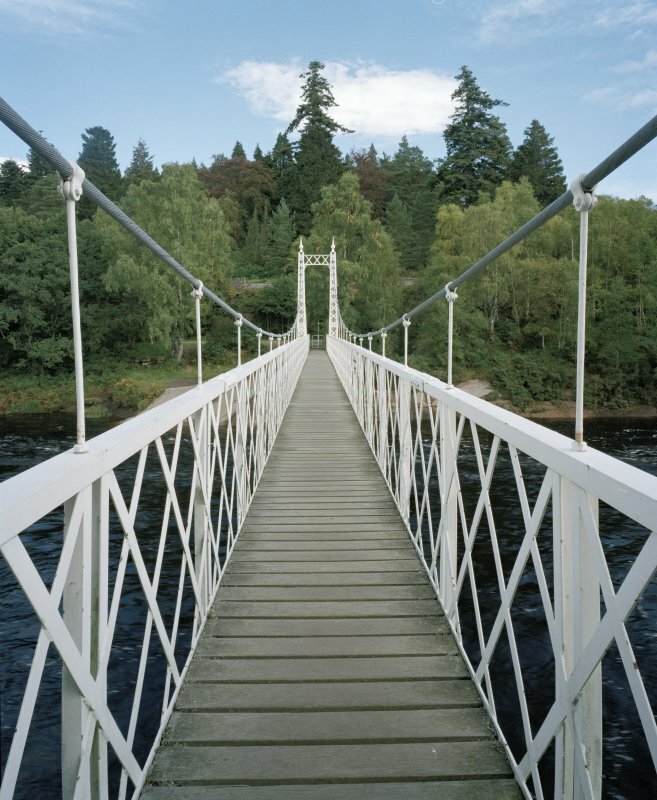 A lattice truss with sides 46ins [1.24m] high carries the wooden deck which is 4ft [1.2m] wide. The suspender rods are bolted into the top member of this truss, and the cable comes down to within 7ins [178mm] of this. The charm of this light bridge is completed by the entrances. One side has an unusual swing gate, and the other a turnstile with a tall pole; old photographs reveal that the roadside entrance has been changed. There was once a steep flight of steps up to the road. Visible on air photographs AAS/93/11/G22/19-20. Copies held by Grampian Regional Council. Information from M Greig, Grampian Regional Council, March 1994. 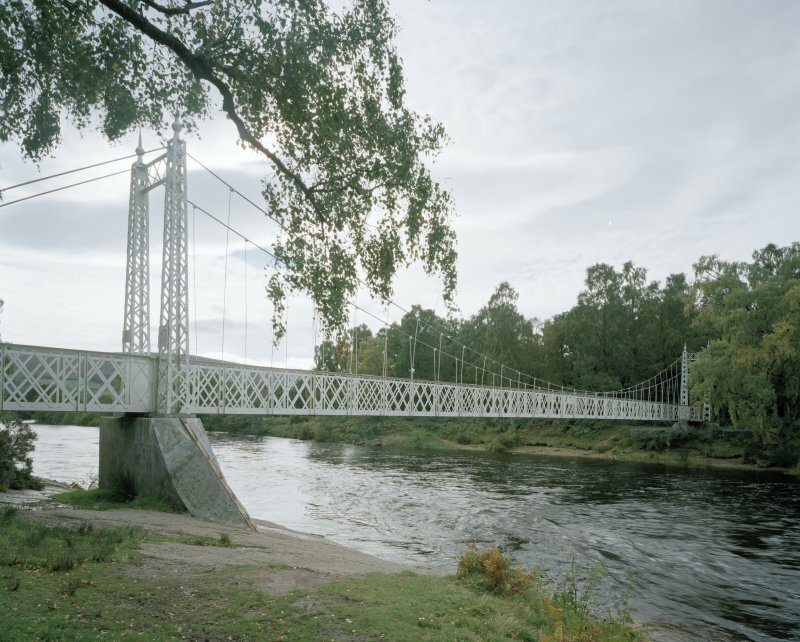 This bridge carries a footpath across the River Dee. Information from RCAHMS (RJCM), 22 August 1997. 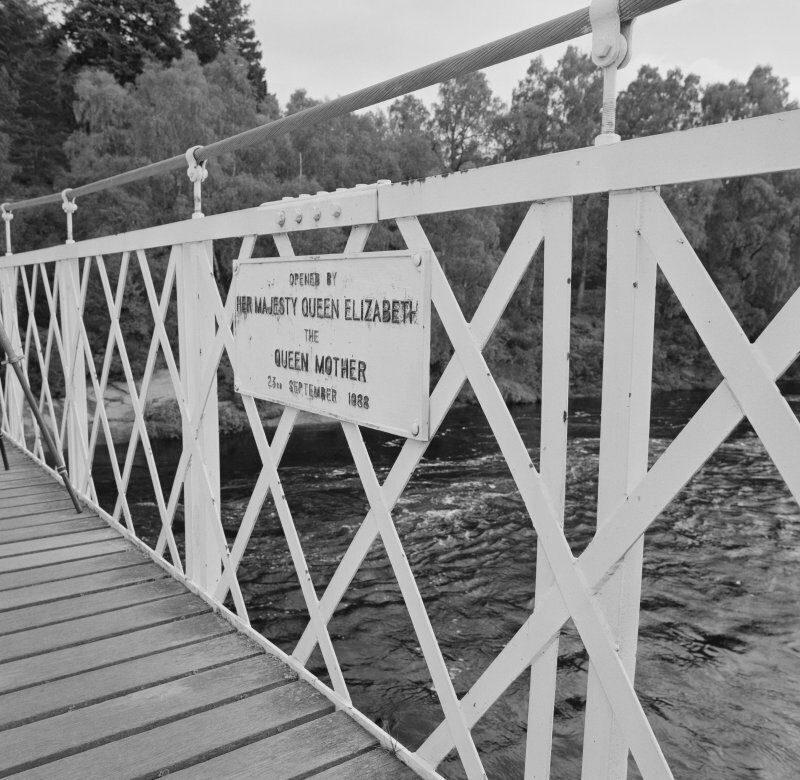 Originally built by James Abernethy in 1905, the bridge was re-opened in 1988 by Queen Elizabeth the Queen Mother following extensive refurbishment. 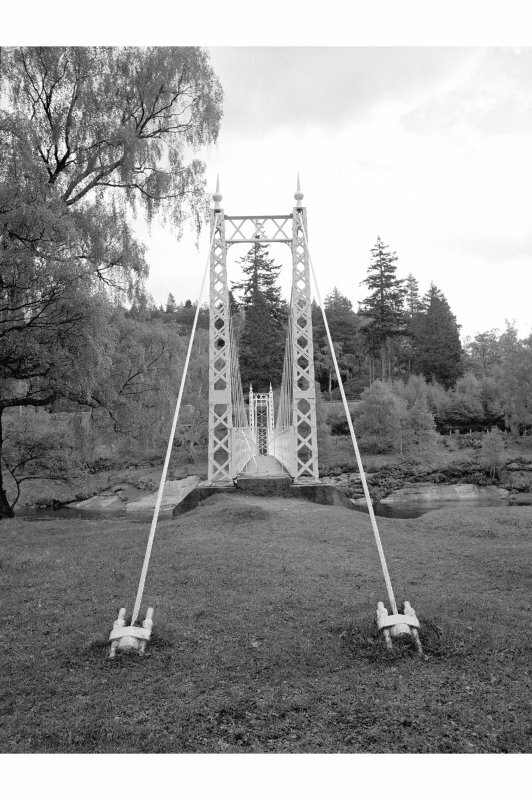 At the time of a RCAHMS photograph survey in 2000, there were proposals to add clamps to the suspension cables to prevent slippage of the hangers. Visited by RCAHMS (MKO), October 2000. Architect: James Abernethy and Company, (Engineer), 1905. 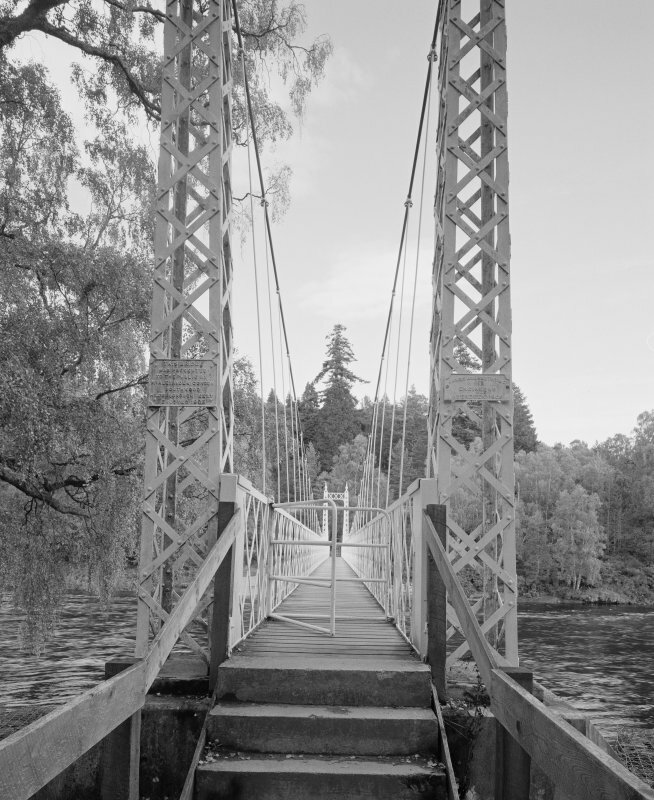 Photographed in 2000 in adavance of the attachment of clamps to the suspension cables.